Ravens have impressive cognitive skills when interacting with conspecifics – comparable to many primates, whose social intelligence has been related to their life in groups. 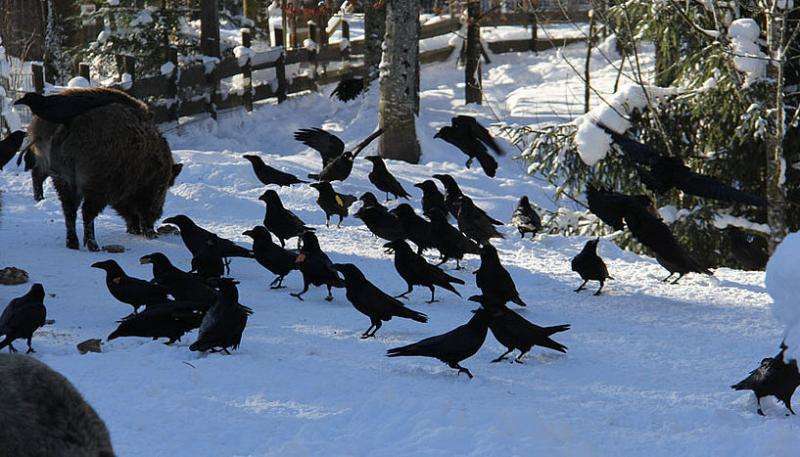 An international collaboration of researchers led by Thomas Bugnyar, Professor at the Department of Cognitive Biology, University of Vienna, could uncover for the first time the group dynamics of non-breeding ravens. The results help to understand the evolution of intelligence in this species and were published in the scientific journal Scientific Reports. Several recent studies have revealed that ravens are among the most intelligent species of birds and even species in general. But which factors caused the evolution of intelligence? According to a common hypothesis life in social groups can drive brain evolution especially when individuals benefit from remembering the identity of conspecifics and the interactions with them. With such knowledge, animals can avoid conflicts with higher ranking group members or develop alliances to gain better access to resources. Researchers around Thomas Bugnyar in Austria and colleagues in France outfitted around 30 ravens with little "backpacks," which measured with GPS the position of the animal every hour. The devices were charged with solar power and the data were transmitted using the GSM network for mobile phones. During the last four years of data collection movements up to 160 kilometers per day were observed. 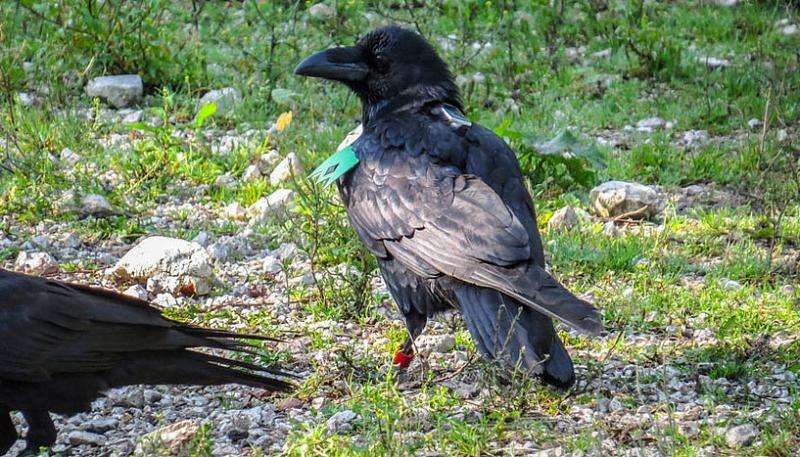 In addition in Austria and Italy a total number of 332 ravens have been marked individually with colored rings and wing-tags and their presence patterns in two study sites were monitored over years. Conclusion of the biologists: While some non-breeding ravens seem to stay only in relatively small areas, others may move thousands of kilometers per year. Still many ravens meet repeatedly in different locations usually at rich food sources (e.g. landfills, compost stations) and adjacent common night roosts. "We were surprised about the similarity to humans: Some people prefer to spend their entire life in a single city or even a small village, while others want to travel and explore the world. We find exactly the same in non-breeding ravens," says lead-author Matthias Loretto. When ravens form groups they make friends but also fight heavily with other group members for access to resources. "Every time a raven joins a group of conspecifics at food sources, it can benefit from remembering previous interactions to decide who is friend or foe. 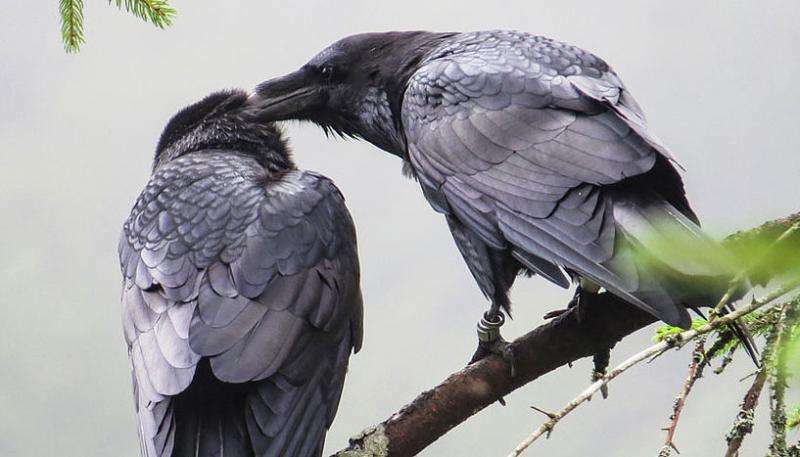 The combination of social bonds within non-breeders and such a highly dynamic system might have driven brain evolution in ravens," says Loretto.